Sakuntala Jayasinghe -Ambanpola Special Corr. The elephant which was hit by the Raja Rata Regina yesterday. Picture by Galgamuwa Group Corr. 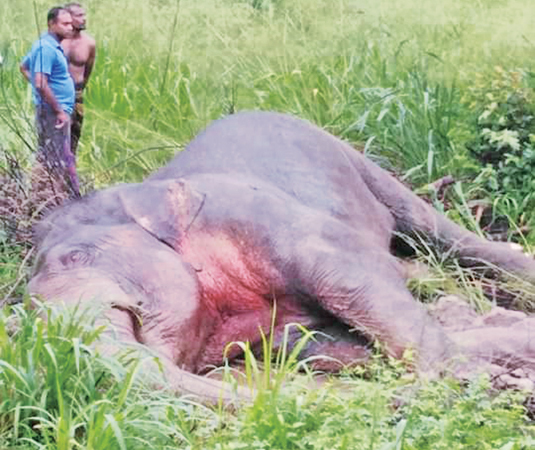 A wild elephant was seriously injured after being knocked down by the Matara-bound Raja Rata Regina from Omanthai, near the Getadivula forest reserve close to the Mee Oya, yesterday morning. The elephant, which was about 40 years old, met with the accident as it was crossing the rail track with the other elephants in the herd to get to the Getadivula reserve. A team of officers from the Galgamuwa Wildlife office arrived on the scene and Nikaweratiya Wildlife office Veterinary Surgeon Isuru Hewakottage treated the injured pachyderm. Three elephants died after being knocked by trains at this elephant crossing point in 2015 and a baby elephant, aged about three months, died at this spot last year. More than 10 wild elephants have been struck by trains since 2017. A committee of experts appointed to propose a solution to the elephant deaths caused by trains recently submitted its report to Transport Minister Nimal Siripala de Silva recently.